Just wanted to let you know I received your Summary Report and check in the mail. Thank you! I am VERY pleased with how things went with the recent auction on my brother's house conducted by Wardlow Auctions. I was very impressed with your level of professionalism, knowledge, timeliness, and results. You guided me through the process step by step, and handled everything, just as promised. Even with the 11th hour curve ball you were thrown, you handled it gracefully. You were always there for me when I needed you. It has been a pleasure to work with you Rick. I would definitely recommend you to anyone wanting/needing to do an auction. Several months ago my business partner and I were faced with a dilemma. Our business had changed. We once had 20,000 square feet, now we have 3,000 square feet. Over 27 years we had accumulated equipment to fill those 20,000 square feet. Now, we didn’t have the space to house all of the things we no longer needed. We toyed with the idea of having a big yard sale, or putting things up for auction on eBay. Then we contacted Wardlow Auctions. Looking over the items we had to sell, Rick Wardlow said, “If you put these items up for auction, you will sell everything.” We found that hard to believe. Sure, some items didn’t fetch as much as we felt they were worth. Then again, some items got substantially more than we’d hoped for. The bottom line is that we are now relieved of all of our excess inventory and received more overall that we suspected we could. Joe Gribbins and Rick Wardlow couldn’t have been more professional. We highly recommend Wardlow Auctions to anyone who is contemplating doing an auction. Thank you so much for such a fun, exciting and professional experience, not to mention, highly successful. I can't say enough about how professional and efficient you and your staff were to get this auction in place. You had a whopping 2 weeks to catalogue, organize, clean, and advertise this auction and it by far exceeded our expectations. I have always held you in high regard but this just confirms my faith and trust in you. I enjoyed working with you on a professional level at many live and silent auctions that I held. I never dreamed that I would hold an online auction of my household belongings. I am so glad that Idid! Congratulations to a great company with awesome staff. I would not recommend anyone else to run an auction for them. Just a note of thanks for the superb job you and the staff of Wardlow Auctions performed in handling the sale of my uncle’s estate. Your knowledge of the entire auction process, and your ability to answer all our questions, eased our fears during the difficult task of selling my uncle’s real estate, vehicles, guns, and personal property. The sale price of the house and everything else far exceeded our expectations. We cannot thank you enough for guiding us through this process. Wardlow Auctions is a top-notch organization! It is my pleasure to recommend Rick Wardlow Auctions, Inc. to anyone interested in selling a home and/or personal property. I was responsible for selling my parents' home and an auction seemed to fit my needs since I lived nine hours away and I desired to sell the property quickly and efficientlly. Fortunately, I have two friends who had very positive experiences using auctions to dispose of real estate and personal property, so I felt this was the right option for me. I must say I was positively impressed. All in all, it was a very well organized, professional event and I compliment you on it. We never expected an auction could be the best choice…but it definitely was. Your whole crew was very professional and we could tell that everyone was concerned about how well things would go for the sale to make it in our best interest. We would definitely recommend an auction to others – it turned out so well for all of us. The Kamer family would like to express our appreciation and thanks to Wardlow Auctions for a job well done in helping us settle the estate of our parents, Mr. and Mrs. Martin Kamer Sr. The entire process, from the initial meeting to the actual auction, was conducted in a very cooperative, thorough, and respectful manner. It was obvious that many hours of preparation were spent in preparing the house and its contents. The real estate and the personal property auctions were so efficiently and effectively handled it was a pleasure to observe. Also it was evident that Wardlow's marketing, advertising, signage, and internet exposure all did their part in drawing the large crowd of bidders to the auction. We marvel at Wardlow's attention to planning and execution of every detail, too many to mention. To all the Wardlow personnel who helped with the auciton, we applaud your work. Rick, Joe, and Allee.......your dedication and professionalism are to be commended. Thank you again, and we positively and without hesitation, sincerely say we highly recommend Wardlow Auctions. I have been meaning to write for some time to express my appreciation for the excellent job you and everyone at Wardlow Auctions did in helping me with the personal property and real estate auctions of my father’s estate. As I’m sure is true for many who undergo the loss of a family member, I found myself on unfamiliar ground without any prior experience to draw upon. I consider myself blessed that my dad had a lawyer who was tremendously helpful, and who recommended Wardlow Auctions to me. I also appreciate the advice and wisdom both you and Joe Gribbins shared regularly as decisions regarding the estate became necessary. It is no exaggeration to say that the results of the auctions you conducted for the estate exceeded my most optimistic expectations, and I cannot imagine that trying to liquidate the estate in any other manner would have yielded the same results. On the day of the real estate auction, I was so impressed with how deftly you, Joe, Rick Wardlow and Brent Gribbins managed the proceedings, both in person and online. Having all of you there participating gave me further confidence that I could not have made a better choice, and I believe the results bear that out. a reference for Wardlow Auctions at any time. Thank you again for your professional abilities and your personal compassion. Wardlow Auctions, through your professionalism and expert handling of the sale of my dad’s home and belongings, has far exceeded my expectations for a successful outcome. When my dad moved into an assisted living facility this summer I was faced with the overwhelming task of organizing his accumulation of a lifetime’s belongings to be sold as well as selling his home of almost 40 years. I had never been faced with a task such as this and I didn’t even know where to start. Luckily, I received a referral to Wardlow Auctions from a friend who had seen your highly successful handling of the sale of a neighbor’s estate and home. From the time I contacted Wardlow Auctions you provided invaluable assistance. Beginning with sorting and disposing of items that would not be saleable and then grouping other items and preparing them for the auction, your staff was remarkably efficient and knowledgeable as well as being highly professional and totally trustworthy. In a matter of several weeks, what had looked like a totally overwhelming task had been handled and we were ready for the auction. Even though the weather did not cooperate and we had a cold, rainy day, your advertising and preparation produced a turnout of more than 250 people at the auction. What might easily have taken weeks or months was taken care of in a few hours on one day. The house and the belongings sold and your staff handled all transactions easily and efficiently. I wouldn’t have believed it would be possible to say this, but Wardlow has turned an task I had dreaded for years into a pleasant and successful experience. I highly recommend Wardlow Auctions to anyone faced with the disposition of a home or an estate. I am very grateful that Wardlow was my partner in this enormous task. Thanks so much. Just a short not to say thank you for all your help in closing our transaction. It has been a pleasure to work with you and I appreciate your professionalism, as well as humor. The industry needs more people like you! Just wanted to say thank you for the terrific job you did .... You are always so professional, it is a pleasure to work with you and your team. Thank you for doing such a splendid job. I was totally unfamiliar with the auction process. You made it very enjoyable as well as far more rewarding than I had dared to hope! 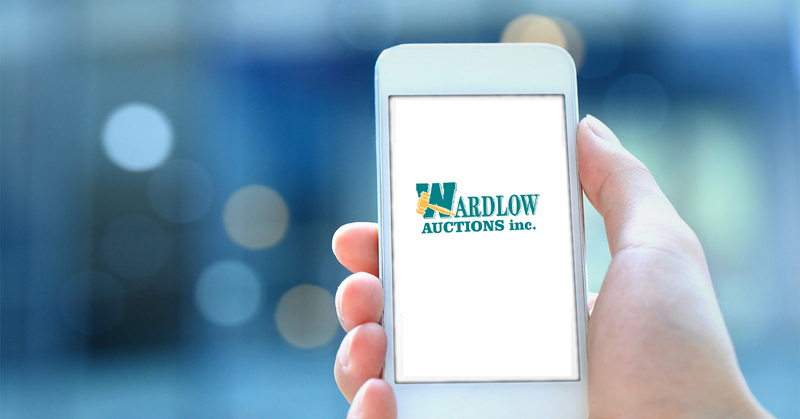 Make following our auctions and bidding easier by downloading our APP to your phone or tablet. Works with Apple and Android.